Tee Beams, or T-Beams in Houston | Steel Supply, L.P.
Steel Tee Beams, though less commonly used in construction than other structural shapes, can offer certain advantages when used correctly. A Tee Beam is a steel profile that is not typically made at the mill. Mills only produce small sizes. Larger steel tees are produced by splitting beams, most commonly Wide Flange Beams, but occasionally I-Beams. We use a specially made device to cut the web of a beam to produce two tees. Generally, the cut is made down the middle of the beam but it can be cut off center. 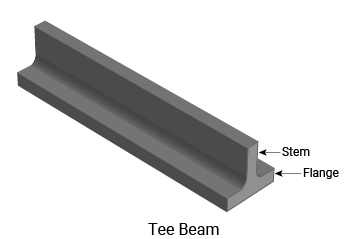 Once cut, the portion of the beam that was known as the web is now called a stem when discussed as part of a Tee Beam. Because Tee Beams are cut from Wide Flange Beams, we offer them in pairs of galvanized or raw steel. 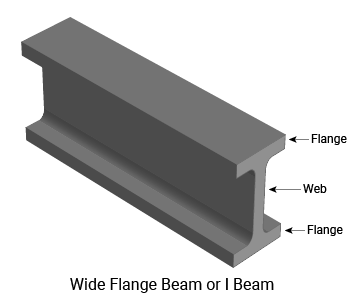 Tee Beams split from Wide Flange Beams are designated as “WT” preceding the size (stem height X weight/foot X length). For example, a Wide Flange Beam size W12 x 30 X 20 split to a Tee Beam would be designated WT6 X 15 X 20 since the 12-inch height of the original beam split in half = 6 inches and the 30 pounds per foot of the original beam split in half = 15 pounds.